Another day, another wise statement from brilliant mind Vladimir Putin. The Russian President took time away from his busy schedule of silencing other people's voices by adding one of his own, weighing in on the value of former Secretary of State, Senator and First Lady Hillary Clinton. In March, Clinton said that Putin's decision to go into Ukraine was similar "to what Hitler did back in the '30s," though she added that there was no indication that Putin would go as far as Hitler did (i.e. kill many, many people because of racial purity concerns). Clinton later said she hadn't meant to directly compare the two leaders. Now The Moscow Times reports that in an interview with members of the French media, Putin has responded to those comments by calling Clinton "weak" – though because she's a lady, that's not an insult! "It's better not to argue with women. But Ms Clinton has never been too graceful in her statements," Putin was quoted as saying in a transcript published on the Kremlin website. "When people push boundaries too far, it's not because they are strong but because they are weak. 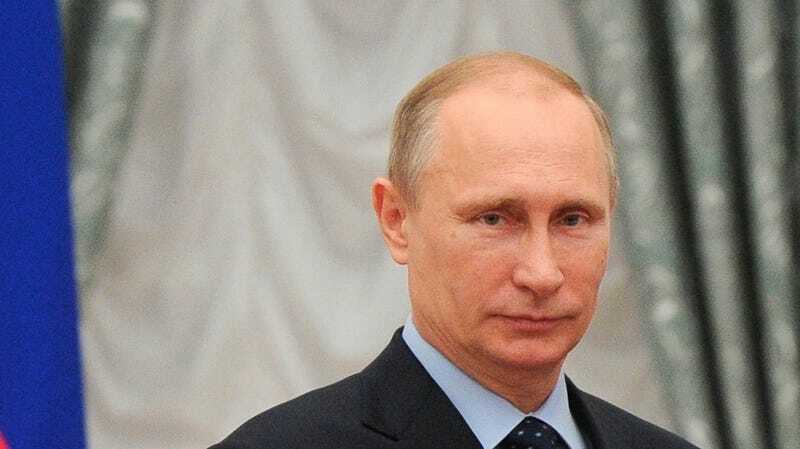 But maybe weakness is not the worst quality for a woman," Putin added in the interview. A beautifully expressed backhanded compliment. One for the ages.